Which data visualization should I use? We use data visualization to represent complex numerical data and patterns in a clear and concise format. 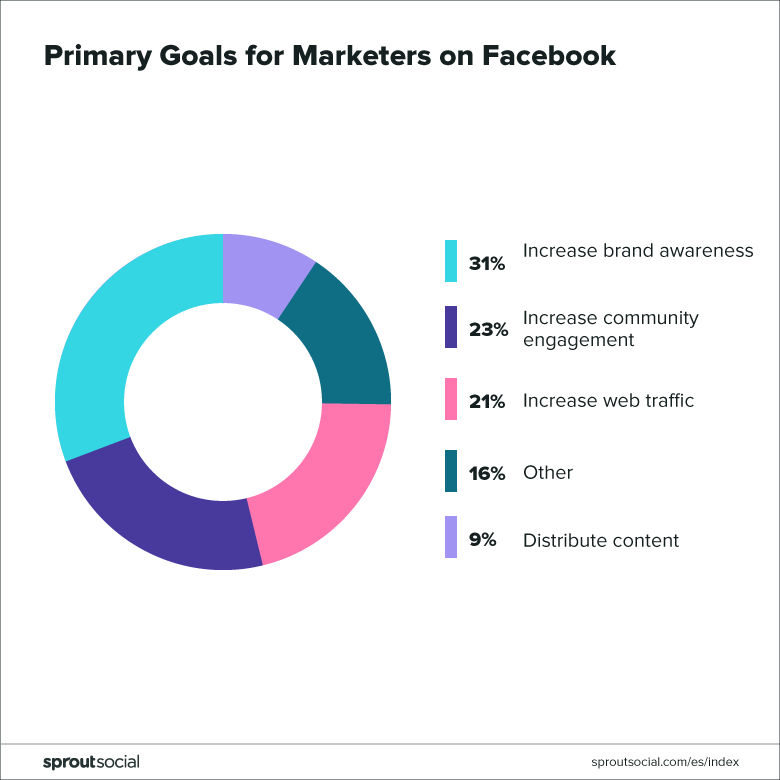 We use infographics to present simple data in a more compelling format. A data visualization prioritizes conveying large amounts of numerical information in a simple, visually digestible format. These visual representations of data should be aesthetically appealing, but not at the expense of being clear, consistent and thoughtful. Data visualizations are generally used in projects like annual report, data reports, and other data-heavy communication. 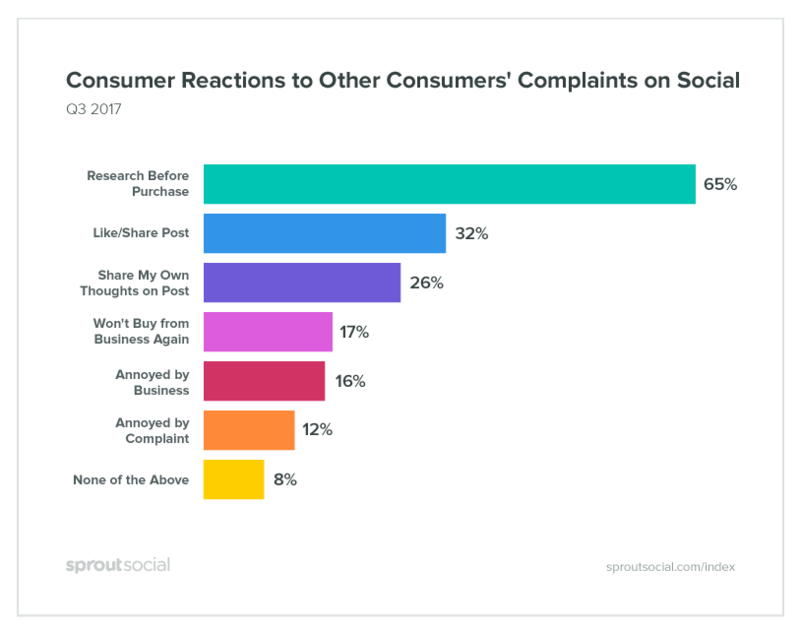 At Sprout, we primarily use data visualizations in the Sprout Social Index and Brands Get Real. Charts should sit on a white background with a gray border. The Sprout Social or Bambu logo should be located in the bottom-left and a URL in the bottom-right. It’s about contrast! Color should be distinct to allow the viewer to quickly and easily distinguish data points. DO: Use contrasting colors to differentiate between pieces of data (e.g. teal for Retail Response Rate, purple for Technology Response Rate, Gray for Healthcare Response Rate). DO: Use shades of the same hue to visually relate data (e.g. light green for Retail Response Rate 2016 and dark green for Retail Response Rate 2017. DON’T: Do not use red or network colors in bar charts. 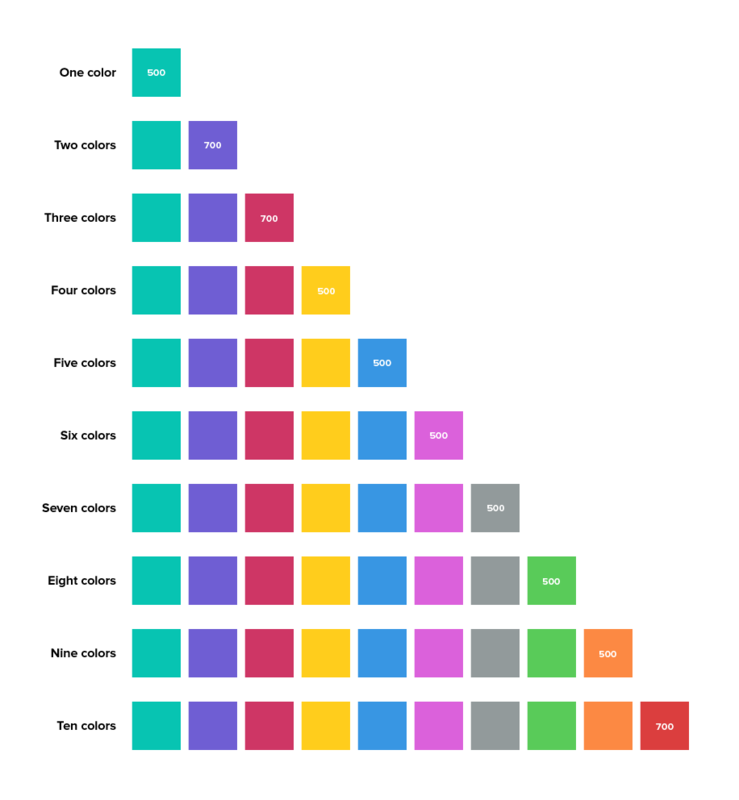 If you’re creating data visualizations for a brand campaign or initiative that has a specific color palette, you don’t need to use this color system. However, you should make sure that the colors you use have sufficient color contrast on the color wheel (avoid analogous color schemes). Bar charts are used for comparing discrete categories. Use a bar chart when there is a constraint to the number of data points that can appear on the visualization; otherwise, it becomes difficult to scale. Discrete categories of data, like Retail vs Technology. DO: Sort data in bar charts from highest to lowest. DO: Right-align topic labels in bar charts to the y-axis. Numerical values should be left aligned with the end of a given topic’s data bar. DON’T: Use a vertical bar chart if the labels are lengthy. Use a horizontal bar chart (see below) to give labels more space. 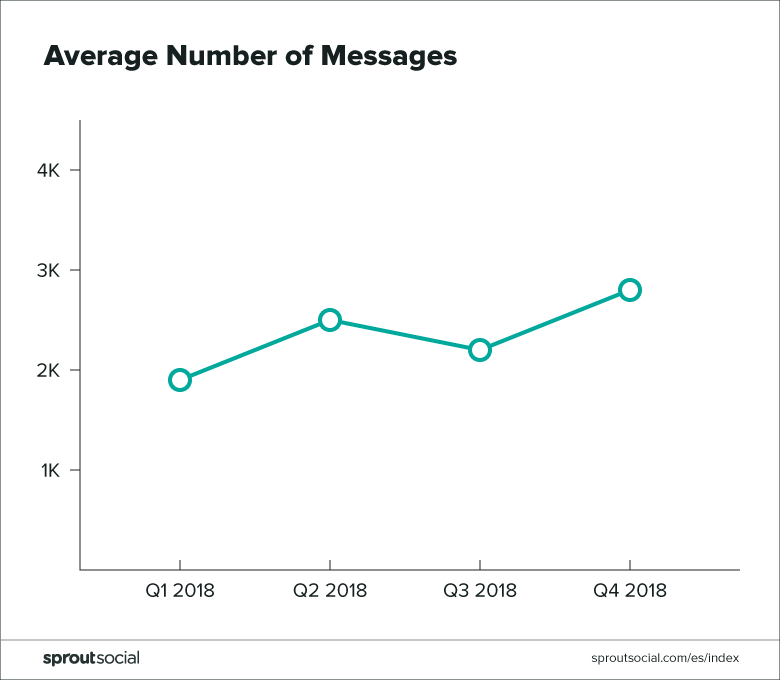 A line chart is created by connecting a series of data points together with a line. Line charts are good to show change over time, comparisons, and trends. Showing continuous data like sales or orders over time (Q1–Q4 2018). DO: Show the whole y-axis. DON’T: Use inconsistent intervals (skipping certain months, quarters, or other data points). Data labels and/or numerical values in line charts should be right aligned to the y-axis and center aligned on the x-axis. Data labels within the chart should be centered and placed above the corresponding data point. Pie charts are best to use when you are trying to compare parts of a whole (ie x% out of 100%). They do not show changes over time. They work best when the data points are simple and comparisons between different percentages are dramatic. Comparing parts of a whole. DO: Use to convey five or fewer discrete categories that add up to 100%. DO: Use to turn very simple data points (59% says “yes”) into a compelling visual. DO: Use a 1px stroke between sections of the pie if it helps add visual clarity between similar colors. DON’T: Use when there are so many data points that it is difficult to make distinctions between points. Because pie charts do not lend well to heavy text usage in the chart itself, keys are a good way to display topic labels. A table is a good way to showcase a large amount of information which has a variety of columns and data to show for each entity. A table should be used when multiple metrics and categories need to be presented together, and accurate lookup of the data values is more important that showing patterns in the data. DO: Use lines and spacing to separate rows/cells of data. DON’T: Use zebra striping (aka, alternating row colors). An infographic should be used to present simple data in an eye-catching, interesting way. Infographics are opportunities to use numerical information to support an accompanying story or to provide an opinion. As such, the guidelines around infographic design are much looser than more traditional data visualizations and a lot of what is presented about tweaked significantly. Infographics can take many forms as their only goal is to support a single data point while adding visual interest. Some infographics may also use iconography or imagery to continue the contextual narrative.